Eddie MacDonald bounced back from last week’s disappointing run at NHIS to post a third place finish in the MBNA 150 at Dover International Speedway. The HRM Motorsports team continues to work hard despite the misfortunes suffered in a number of races this season and there was a great sense of satisfaction and relief after the solid run. “ We really needed this finish after all we’ve been through this season. We thought we had it last week and it didn’t happen but this crew never gives up and they proved it today. 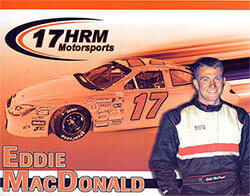 The car they gave me was great and I am really happy for them to get this finish,” said MacDonald. The # 17 Ford was very fast as soon as it hit the track. Before qualifying, it was third fastest in practice and during the final practice MacDonald again had the third fastest car. He was able to qualify in seventh place with a speed of 145.068 mph. around the “ Monster Mile”. “ Qualifying near the front here is very important since it is such a fast track, cars in the back get lapped quickly,” said MacDonald. The importance was well stated as leader Paul Wolfe began lapping cars by the 20th circuit with only six cars finishing on the lead lap. “ The car was really neutral and free everywhere, and we were fast and riding steady in fourth place but after 30-40 laps into it, it got real loose. During the second caution we put on four tires and made a wedge adjustment but then it got a little tight. We came in again on another caution and got it a little better and that is what we needed to do to stay near the front and be able to make our move at the end,” said MacDonald. A series of late race cautions bunched the field allowing MacDonald to move from 10th to fourth, when a number of cars got together in front of him, and into third place after the incident with Stefanik. This was the third top five finish for the team and MacDonald hopes to finish strong with a good showing at Wall Stadium this Saturday in the final race of the regular season. “ We had two great cars at NHIS and Dover and the crew is determined to give me another good one for Wall to end on a positive note,” said MacDonald. “After all we have been through this season, a top five finish there would be a great reward to this team for all the hard work and dedication.